This is one of those bands you have to see to believe. Made from a generous amount of 14kt White gold, the band contains 1.75ct total weight of excellent quality, White Diamonds. The Diamonds are “G-H” in color and “VS” in clarity. The Diamonds almost cover the entire band except one spot which allows for sizing. 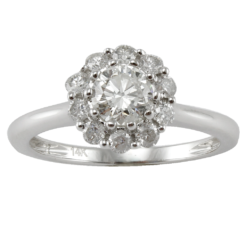 A true precious piece that would look stunning on any finger.